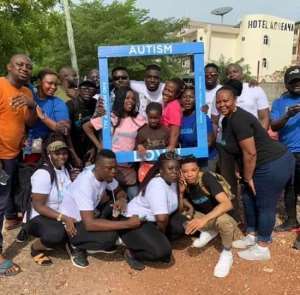 The Social Media based group that ended 2018 with a charity event to feed street children in Accra has taken their benevolence to a whole new level by showing solidarity to persons with autism at Tema. With the month of April set aside globally to draw awareness on autism, a lot of organisations in the country have taken the opportunity to extend support to those on the spectrum, one of such organisations is Korliba Group. Popularly know us KBA group, the group collaborated with Hopesetters Autism Centre in the Tema Metropolis to march from Tema Community One to Community Eleven, where an aerobics session was held and saw massive participation from all stakeholders. An undisclosed amount of money believed to be in excess of Thousand Ghana Cedis was also presented to Hopesetters Centre to support their operation with the assurance of more support during the cause of the year from the group. In recognition of KBA’s effort and benevolence, Hopessetters Center presented to the group a beautifully designed and framed participation certificate. The leader of KBA Group, Ignatius Baidoo, known on Social Media as Mick More Gh in an interview with a section of the media called on government to establish a dedicated intervention program to provide support for persons on the spectrum because it places lifelong financial stress on parents whose children suffer from the disorder. Given the drastic manner autism children and their immediate families, it is long overdue to look at their plight and offer them all the support they need to be comfortable. He further admonished the people of Ghana to treat persons suffering from autism as they would any human being because they are not inferior and possess unique qualities that can be harnessed for the development of the nation. “To make these children live a normal life to some degree and make tremendous progress in their painful journey to adjust and adapt to the world, we all owe it a duty to treat them with love and respect because alienating them worsens their condition. He also called for in-depth public education on autism because according to him “most Ghanaians are very ignorant about autism and even deem it to be the result of demonic attack” and that is very regressive as far as their development and integrating into society is concerned. Four out of every Five Autism victims are male with the cause still a medical mystery.